This sketch was a lot of fun! Some of them kinda stump me at first but this one flowed easily! 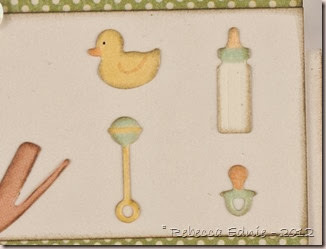 The ‘Baby’ die is by Marianne I think and the baby things are by Memory Box. They are really quite teensy, for comparison, this is a 5×7 card. The bottle and rattle are about a bit less than an inch high and the soother is only about 3/8” high! I coloured them with Copics and oh, so gently sponged them with Distress ink. I also had to be very careful with the word to get ink sponged on the inside areas of the die. I used a Fantastik for the tiny areas. It’s like a sponge tipped pen you can dip in ink. Also good for fixing missed areas of solid stamping. The papers are from Little Darlings and G45’s patterns and solids pack. 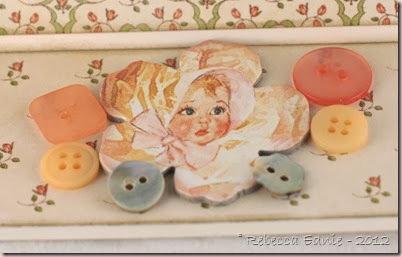 The baby face flower is a chipboard piece. The greyish buttons are Mother of Pearl and look so much nicer IRL! I have a couple girlfriends who are pregnant right now so hopefully one of them has a little girl! I have several boy cards already in my stash. 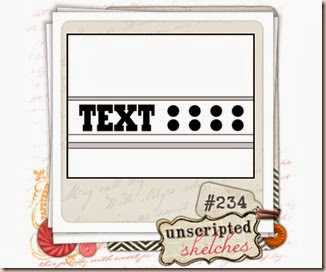 I do hope to see you over at Unscripted Sketches later this week! We’d love to have you join us! Even if you can’t play. be sure to check out the DT’s awesome projects; they are a talented bunch!